Providence will be available June 19, 2018. 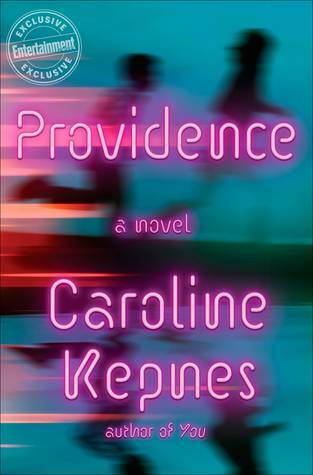 Providence included some of the addictive writing I’ve come to associate with Caroline Kepnes, but it was not enough to make this book really stand out for me. Unlike Kepnes’ You series, I thought this book was missing that one compelling character that would make up for any issues I had with the plot. Providence is told from three different POVs – Jon, Chloe, and Eggs – and unfortunately I never really connected with any of them. Pretty much every review I’ve read has praised Eggs as the best character, but I just never really cared that much about him. I thought Chloe was incredibly unlikable. I did like and really feel for Jon, but even with all he’s gone through, he still felt like a pretty one-dimensional character. The theme of the story is supposed to evolve around love and obsession and I just never really bought it. I don’t really think Jon and Chloe loved each other. I think they’re both emotionally stunted from what happened when they were young teenagers and they just never really grew up. They had a crush on each other, which was then intensified by the whole “want what you can’t have” thing. And I hate to keep making comparisons to You, but the obsession angle fell a little short for me, too. I feel like The Dunwich Horror should have been required reading prior to starting this. It and Lovecraft’s life and other works were referenced often and while there was some explanation, I still feel like I missed something by not being familiar with it. I also did not really feel inspired to go check out his work after reading this. It kind of seemed like there was some lesson or big emotional impact I was supposed to experience by the end of the book, but I never did. Overall, Providence had some moments of addictive writing, but just wasn’t the book for me. I didn’t really like any of the characters and I thought the story was just kind of depressing. I also thought there were some inconsistencies in how Jon’s power works and I didn’t really appreciate the lack of resolution at the end of the book. Though I did enjoy parts of it, I’m still left wondering what exactly the point of it all was. I just don’t think this author is for me. I’ve not heard anything good about this book. And I thought YOU was just okay. Great review! I wish it had been better for you. Thank you! I thought the “You” series was much better than this, so if you weren’t impressed with that, I don’t think this would be for you either. Thank you! I definitely think you can pass on this one. “You” was much, much better. I haven’t read anything by this author before but want to read You. There’s going to be (or already is, not sure) a TV series based on it, so i need to read it first. This story on the other hand might not be for me either. The lack of good characters sounds like a bummer. Yes, I think the You tv show starts this fall! I’m very excited for it. I think you’re better off trying that one rather than this one. I’ve seen a couple good reviews on it, but it just wasn’t for me. I don’t really think you’re missing anything if you decide to skip it.